The upcoming LCWS2013 is likely to become a linear collider milestone. 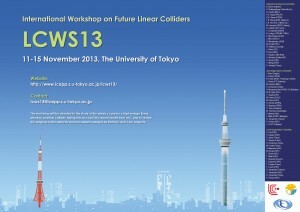 The international linear collider workshop LCWS13 will be hosted by the University of Tokyo from 11 to 15 November. In June 2013, the ILC TDR was completed and the new international linear collider organisation LCC has fully taken over from the GDE (Global Design Effort) and RD (Research Directorate) that coordinated the activities to produce the ILC TDR. This marked the culmination of the enormous amount of work that dates back to the selection in 2004 of the superconducting accelerating technology as the basis for a linear collider. LCWS13 is the first international linear collider workshop after the completion of the ILC TDR, and accordingly the goal of the workshop goes beyond that of previous linear workshops in that we will be focused on moving beyond production of the design documents and towards the realisation of a linear collider. In addition the European strategy, where CLIC is highlighted as one of two main options for a next energy frontier machine after the LHC at CERN, provides clear longer-term challenges also for the normal-conducting technology. So, LCWS13 is timely for both projects’ next technical challenges, but it is also timely in two important ways having to do with events in Japan and the possibility of hosting the ILC there. First, on 23 August, the ILC site evaluation committee of Japan announced that the two candidate sites had been down-selected to one; namely, the Kitakami site in Tohoku. There has been strong support for the ILC in both of the two candidate sites, and many officials of the local governments and industrial organisations have been working intensively for many years to prepare for the ILC to be sited in their regions. Thus, the selection has been a difficult process, but it has been done in a fair and scientific way, allowing the design effort by LCC now to focus on the selected site. In fact, the site-specific design effort is being started based on the Kitakami site, and on 17 October, the LCC management visited the Kitakami site. Within Japan, support by national organisations such as the Advanced Accelerator Association Promoting Science and Technology (AAA) can move forward based on the selected site. Appropriate a fund to create a new committee to intensively study for 2 to 3 years critical issues of the ILC including international resource sharing and domestic organisation. In parallel to the above, conduct negotiations with laboratories and funding authorities of other countries and regions on international resource sharing. It also says that ‘it is too early at this time to grant a full-scale implementation of the ILC’, but such action cannot be taken anyway until international agreements are reached. The report by the SCJ is, in fact, pretty much the best one can hope for from the committee. The current number of registrants for LCWS13 is close to 300 and growing, and this is by far the largest attendance for the linear collider workshops that have been held in Asia. We expect that LCWS13 will be an important and interesting meeting, and it is quite possible that we will look back at this workshop as a benchmark event where the ILC would have moved toward its realisation and where the CLIC progress and plans, as well as many common studies, would have been intensified. See you in Tokyo soon!